Banbridge YCOB have been deducted nine points after fielding an unregistered player - their manager! 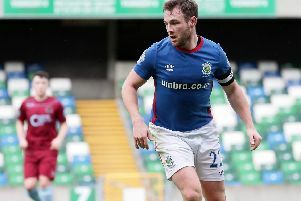 The club lost the points after Kieran McCourt had named himself in several league matches without having been properly registered as a player. They did get some consolation on Saturday when they bulled their way into the Magee Cup final with a 3-0 win over Millbrook. Luckily, McCourt hadn’t played in any of the Cup matches and so he will still lead his team into the decider next month. Banbridge YCOB had been in third place in the Mid Ulster Football League Division Four with 15 points, but they now lie in seventh with just six points. They are now a startling 15 points behind second place but, with two matches in hand, Manager McCourt is confident his side can still finish in second place. “We are still capable of getting promoted,” he said. “I believe we can still catch second. Meanwhile, on Saturday YCOB secured a comfortable 3-0 win over Millbrook in the Magee Cup semi final. They opened the scoring when Gartland headed in from a McKay cross inside the first two minutes. With 20 minutes on the clock, YCOB got their first corner and a well worked set-piece straight resulted in striker Stevie McArdle doubling the lead. Veteran Paddy Burns came on as a sub, and after ten minutes he proved that class is permanent. Standing 30 yards from goal, he looked up, saw the Millbrook keeper off his line and lofted the ball over the stopper into the top corner. There was joy as YCOB secured their spot in the final.